In the last post, The “Hautere Turnips” of Te Horo, the origin and history of the stone walls, cairns and piles characteristic of this area was discussed. Another unusual feature of Te Horo is the large number of totara groves that can be seen in the fields. This is unusual because when Europeans cleared the lowland forest to make way for pastoral farmland in the late 19th century, this was generally done in a wholesale manner, leaving virtually no forest trees behind. The size and uniformity of the trees also suggests that they are not original; that they have regenerated at some point in the last 50 to 100 years. And it is here that I think there may in fact be a connection between the large number of totara and the greywacke rocks so characteristic of the area. It is possible that the prolific nature of the greywacke stones and boulders in the soil of this area created such an obstruction to pastoral farming (and certainly cropping, which requires ploughing), that farmers did not farm particularly intensively, leaving groves of trees to spring up on their farm. Totara was likely to have been a dominant species in the area, and therefore was the species most likely to regenerate as a canopy species. This is only a theory, but it is my sense that the groves are too extensive to have been a deliberate land management decision on the part of one or two landowners – they are more likely to have been the result of particular environmental conditions, such as the stony quality of the soil. Whatever the reason, the groves give the area a special appeal, and are probably much appreciated by cattle and other farm stock for the relief they provide from the sun and other elements. 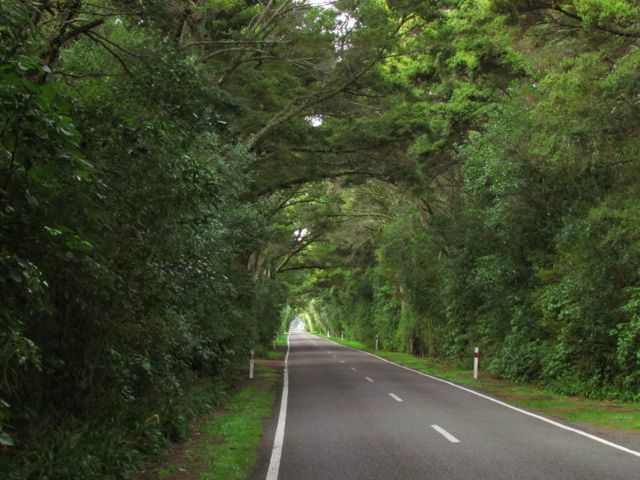 The abundance of totara is recognised in local placenames, including the delightful “Totara Reserve” tunnel on Otaki Gorge Road, and Totaranui Road [meaning “many” or “large totara”]. 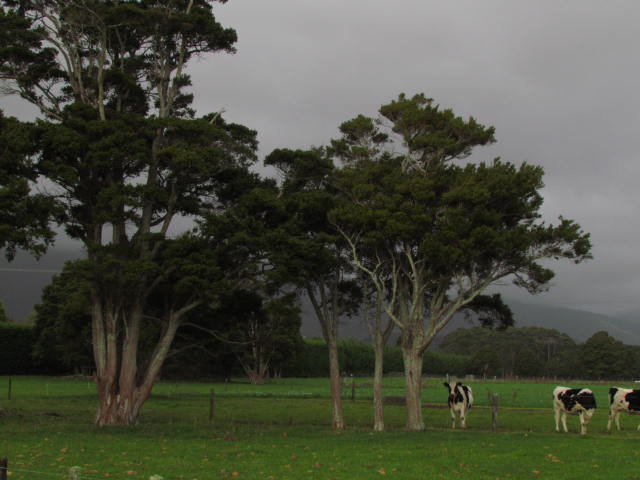 Photo top left: A grove of totara on Old Hautere Road. 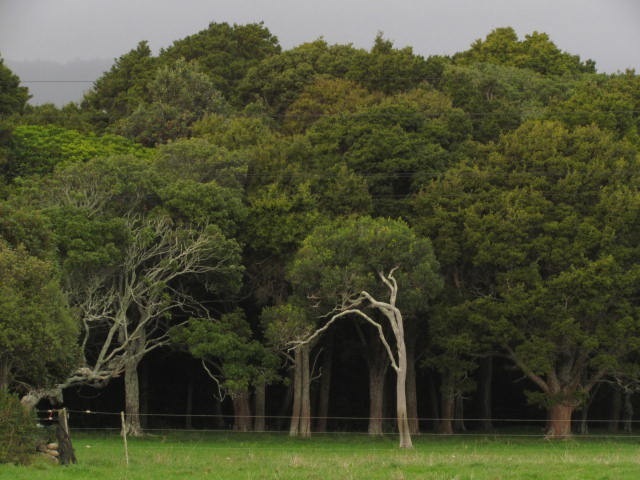 Top centre: A grove of totara on Totaranui Road. Above centre: “Totara Reserve” tree tunnel on Otaki Gorge Road. 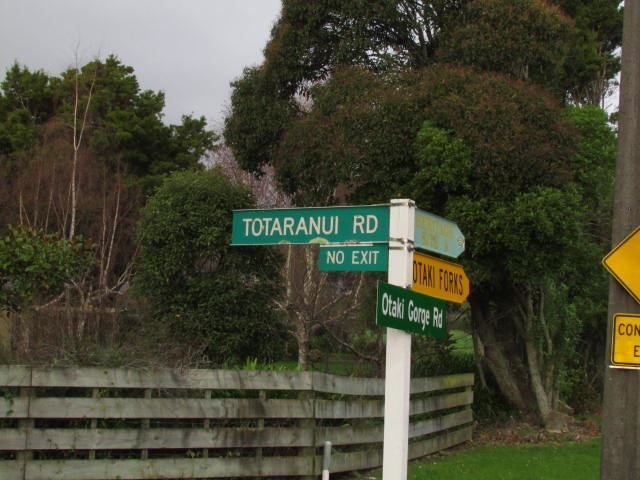 Above right: Totaranui Road sign. (All photos C. Knight). The groves are treasures and I hope they will be treated as such. Another very interesting blog.